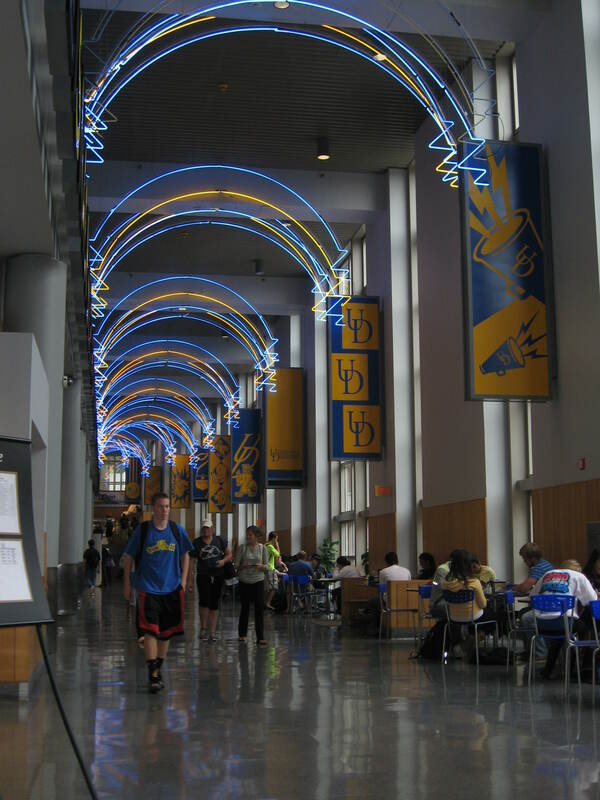 The University of Delaware (UDel) is the most popular college destination for New Jersey residents who want to leave the Garden State. It is also the second most popular school (after West Virginia University) for Pennsylvania residents who leave their state. This alone is a good reason to write and post an updated profile and Pinterest page. From my vantage point in Central New Jersey, there is a lot to like about the University of Delaware. The campus setting is smaller, less intimidating for an incoming freshman than s/he would find at Rutgers-New Brunswick or Penn State-University Park. There’s a good chance that, unless you study Agriculture or need a lift to a football game, that you would never need to ride a campus bus. Downtown Newark (pronounced ‘New-ark’, accenting the second syllable) looks and feels very much like a more famous college town such as Athens, Georgia, but without the crowds on football weekends. UDel can also house just over half of its students, something few flagship state schools can do. UDel competes not only with the flagship state universities of the neighboring states; it is also shopped against the larger private colleges from Boston down to Washington DC. UDel is definitely a better value than most of the private schools for its “bread and butter” 3.75+/1250 SAT students. But it also charges a New Jersey resident about the same as the University of Maryland-College Park or Penn StateUniversity Park, presuming s/he gets into all three schools. When a family is faced with choosing between these three, and has already said no to Rutgers, the less intimidating feel of the campus and the surrounding community, or an academic program, might be the reason to say yes to UDel. Those who say yes to UDel are mostly happy with their decision. Freshman retention has stuck between 92 and 93 percent for several years—and just over 70 percent of those who started finish in four years. The number of flagships that have bested that performance over the past three years can be counted on less than both hands. The alumni base while strongest in and around Philadelphia, is sizable in the New York metro area as well as the Baltimore-Washington Corridor. The University of Delaware is a very good school. I would even call it a Public Ivy, since it does so well with the students it attracts. But is it worth paying an additional $60,000+ to go there instead of Rutgers over four years? For many from New Jersey, the answer is apparently yes. They represent just over a quarter of a freshmen class, not all that far behind the Delawareans. Check out my update on the University of Delaware! Check out my University of Delaware Pinterest page! Visiting colleges? Daytripper University’s travel guides highlight the best restaurants and hotels as well as the most interesting attractions near the University of Delaware. Founded by Liora Yalof and Bonnie Klein and relying on a network of parents, locals and current students, this comprehensive website features guides to over 100 campuses and resources to help you navigate the college process. Need help in starting your college search? Contact me at stuart@educatedquest.com or call me at 609-406-0062.